VUS. In recent EpiGC posts, we discussed how laboratories evaluate sequence variants and the challenges of communicating variants of uncertain significance (VUS) to patients. While VUS results can be frustrating, by working together clinicians and laboratories may accumulate additional evidence that enables a more definitive variant classification. But how, you ask? Well, there are several ways . . .
Review variant(s) in context of the patient’s clinical presentation. There is no substitute for a good, old fashioned clinical evaluation. Many patients have testing for a panel of genes, which makes sense given that given the recent identification of many new epilepsy genes with overlapping phenotypes. However, the downside can be a long list of variants in multiple genes. A careful review of the results in the context of the patient’s clinical presentation and family history may help the clinician determine which variants are the best clinical fit for the patient and should be prioritized for further assessment. Additionally, laboratories rely on ordering providers to supply clinical information when patient samples are submitted for testing. If clinical information is not provided, the lab may not be able to apply certain types of evidence and have to be more cautious in their assessment of a variant, thereby increasing the likelihood of receiving a VUS result. Familial testing. When a VUS is identified, testing both parents and/or other family members may be useful for variant interpretation. 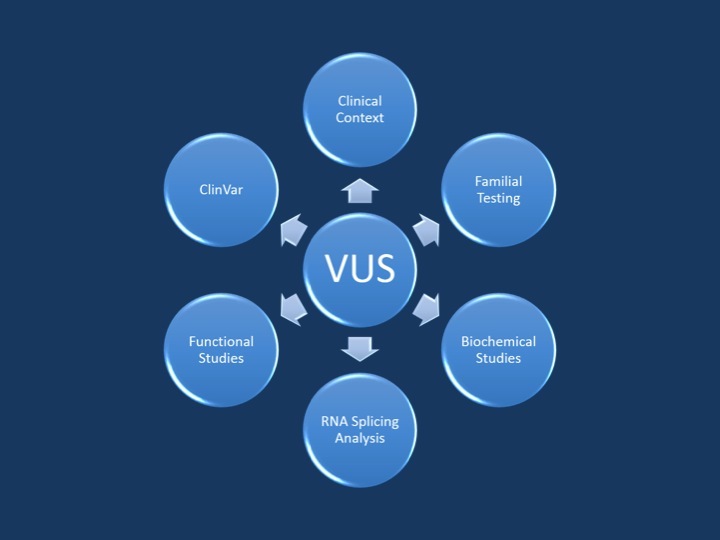 Family members who have testing to help clarify the clinical significance of a VUS do not need full sequencing of the entire gene or testing for a large panel of genes. Instead, the lab will perform targeted testing specifically for the VUS that was identified in the individual with epilepsy. The laboratory may offer this testing at no charge in select relatives whose results may assist with variant classification. Parental testing confirms that a variant is de novo. Pathogenic variants in genes associated with autosomal dominant and some X-linked phenotypes causing severe, early-onset epilepsy are often de novo, meaning that the variant was not inherited from either parent. Finding that a VUS is de novo provides additional evidence to support it may cause disease. However, in many cases maternity and paternity are not confirmed by the laboratory, so it is possible that a variant could incorrectly appear to be de novo because the “parents” who were tested were not the biological parents of the patient. This could occur due to undisclosed non-paternity, the use of an egg or sperm donor to achieve a pregnancy, or a sample mix-up. It is therefore critical that providers inquire gently and respectfully about familial relationships and that they provide this information to the laboratory. The disorder is fully penetrant, meaning that all individuals with a pathogenic variant develop obvious clinical symptoms. The age-of-onset is always younger than the age of the parent being tested. Familial testing indicates that a variant is segregating with the phenotype in the family. In order to alter the classification, there must be evidence that the variant segregates with the phenotype more often than expected based on random chance. Many laboratories employ statistical models to determine the strength of segregation evidence, similar to how LOD scores are calculated in linkage studies. In clinical practice, it is often difficult to accumulate enough evidence to demonstrate that a variant is segregating with a phenotype in a family. However, this is a powerful tool in large families with many affected individuals who are willing to undergo testing. Parental testing indicates that a variant is in trans with a pathogenic variant. Parental testing may be helpful if a patient has two variants in a gene associated with an autosomal recessive disorder. Typically, the lab cannot determine whether two variants are in cis (on the same allele, inherited from a single parent) or in trans (on different alleles, with one variant inherited from each parent) without parental testing. If parental testing indicates that a VUS is in trans with a pathogenic variant, that provides additional evidence to suggest the VUS may be pathogenic. If parental testing indicates that two variants are in cis, then they are less likely to explain the phenotype in the patient. Biochemical testing, RNA splicing analysis, and functional studies. If a VUS is identified in a gene that is a good fit for the patient’s phenotype, in some cases follow-up biochemical testing or other studies may be available to confirm or exclude the diagnosis. In these cases, even though the molecular test results are inconclusive, they may guide the clinician toward a diagnosis that can be confirmed by alternative means. RNA splicing analysis is now available in some clinical diagnostic laboratories to evaluate the small subset of variants predicted to have a possible effect on splicing. It is typically limited to analysis of a blood sample, and it is currently unclear what percentage of VUS results may be able to be reclassified based on RNA splicing analysis. Functional studies are generally considered the “gold standard” for determining whether a variant may be pathogenic or benign and are primarily available through research labs. However, the data from functional studies should always be evaluated critically in the context of other evidence available about a variant. Ongoing follow-up. Variant classification is a dynamic, challenging process that is done based on the information available at the time. Just like in other areas of healthcare, we are always accumulating new knowledge that helps improve our variant assessment and classification process. There are a number of variant databases and patient registries that collect genotypic and phenotypic information. One to bookmark is ClinVar, a free public database supported by the National Center for Biotechnology Information (NCBI) that includes variant interpretations from diagnostic laboratories, researchers and gene-specific databases. Clinicians can check ClinVar to determine how multiple sources classify a variant, review submitted evidence to support the classification, and monitor whether the classification changes over time. Finally – don’t hesitate to contact the diagnostic laboratory to discuss changes in the variant classification. The field is moving rapidly, and today’s VUS may well be tomorrow’s diagnosis for a family. Liz Butler is a member of EpiGC and a certified genetic counselor who serves as the Director of Genetic Counseling Services at GeneDx, where she oversees a team of more than 70 laboratory genetic counselors. Her areas of expertise include genetic testing for epilepsy and neurodevelopmental disorders, with a particular interest in variant interpretation and the clinical applications of whole exome sequencing. Prior to joining GeneDx, she worked as a clinical pediatric and adult genetic counselor as well as a laboratory genetic counselor at Michigan State University. Liz earned her bachelor’s degree from Duquesne University and her master’s degree from the Genetic Counseling Program at the University of Cincinnati. This entry was posted in 2016, EpiGC, variant interpretation. Bookmark the permalink.